The New York Times blatant bias towards the Palestinian narrative was in stark display in articles reviewing the speeches given by the acting-President of the Palestinian Authority Mahmoud Abbas to a large audience of politicians in Ramallah on January 14, 2018, and of the one given by US Vice President Mike Pence to the Israeli Parliament on January 22, 2018. 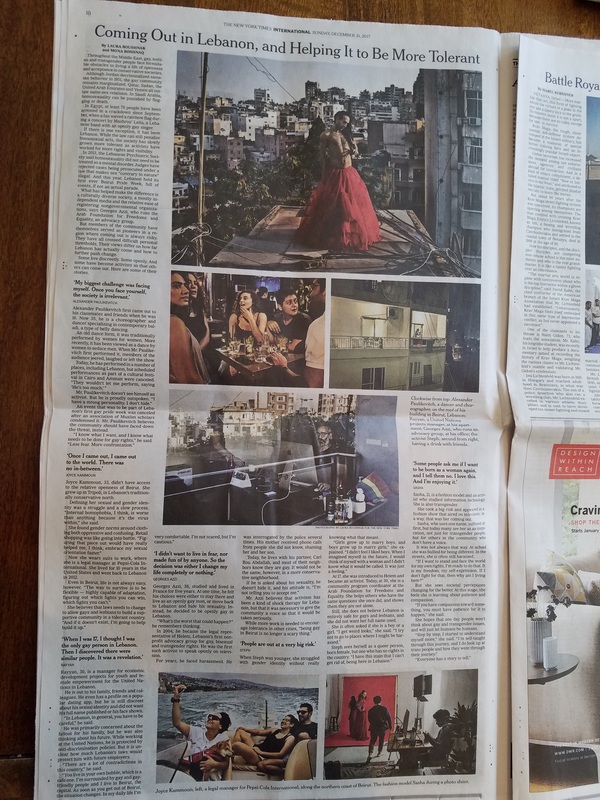 The Times article appeared on the top of page A8 accompanied by a color picture of Abbas. The article relayed Abbas’s speech with supporting commentary throughout the article. Only at the very end of the piece, did the Times offer any competing viewpoints. During its supporting description of Abbas’s speech, the Times deliberately chose to portray Abbas as a man of peace and hope. What did Abbas actually say during his remarks to his Arab audience? Why didn’t the paper use the Abbas statement to comment that Congress had voted on the Taylor Force Act to demand that the PA stop paying terrorist to kill Jews? Because if it did so, it would be shining a light on the despicable Palestinian action promoting murder? 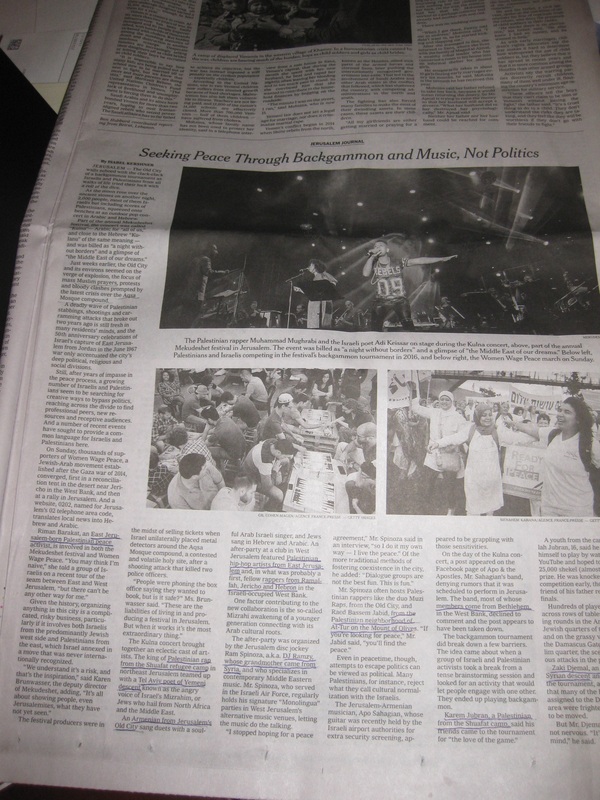 NYT: “Mr. Abbas, 82, stopped well short of embracing an alternative to a two-state solution, the project around which he has built his career. The number of Israelis and Palestinians who hold out hope that such a solution can be achieved is dwindling, but Mr. Abbas said nothing about abandoning it. The Times did not clarify why so many people have become disillusioned with a peace based on a two-state solution, such as an intifada running from 2000 to 2005, and wars raging from Gaza in 2008, 2012 and 2014 killing thousands, even after Israel withdrew all civilians and military forces from Gaza in 2005. 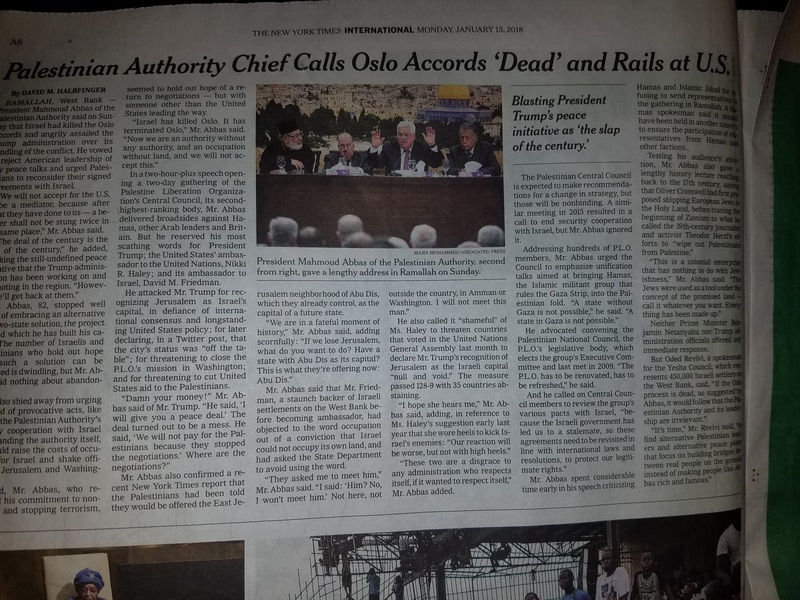 When the Times opted to mention the vile screed of Abbas that the Jews have nothing to do with Israel, it did so at the very end of the article, with an introduction that let people dismiss the content, and with a conclusion that allowed the statement to stand. Did the Times attack this fake history? No. Did it call out Abbas’ rewriting of the entire Old Testament? No. Did it mention that Abbas also claimed that the Arab countries didn’t really evict a million Jews? No. Did it recount Abbas’s doctoral thesis on Holocaust denial? No. Did it mention that the United Nations has similarly been denying Jewish connection to Jerusalem? No. The sloppy New York Times journalism gave a pass to Abbas’s #FakeHistory, and allowed its readership to question the very legitimacy of the Jewish State, just as the Palestinian narrative demands. On January 23, 2018 the Times covered the speech that Vice President Mike Pence delivered to the Israeli Knesset. The article would feature no picture of Pence standing in Israel’s capital of Jerusalem. No Times clarification that Palestine is not yet a state. The Times deliberately misled its readers that that the Trump administration had said the same. The phrasing did not make clear that the standing ovation by the members of Knesset was in favor of expelling the Arabs and drowning out their protest. Once again there was no detail that Trump was taking these moves because the Palestinians support terror and refuse to come to the negotiating table. The Times took its time to set up the article that everything that Pence had to say was objectionable and unwelcome. It did nothing of the sort to introduce the Abbas speech. Throughout the Pence article, in paragraph after paragraph, the Times countered every statement with a Palestinian narrative, a complete reversal of the Abbas article a week earlier when a counter-opinion of the Israeli perspective was only given at the very end of the article, and then, only muted. NYT: “We stand with Israel because we believe in right over wrong, in good over evil and in liberty over tyranny,” Mr. Pence said. Correction: Pence’s initial remarks had to do with the broad connection between the United States and Israel, one of “shared values.” He spoke of George Washington, John Adams and Abraham Lincoln who supported the great contributions of Jews to America and the world, and their rights to live in the Holy Land. Did the Times write that Abbas is an Arab Muslim when he belittled the Bible? Nope. But it decided to highlight Pence’s religion. It was a setup for the ‘messianic extremist’ comment by Saeb Erekat to come later in the article. 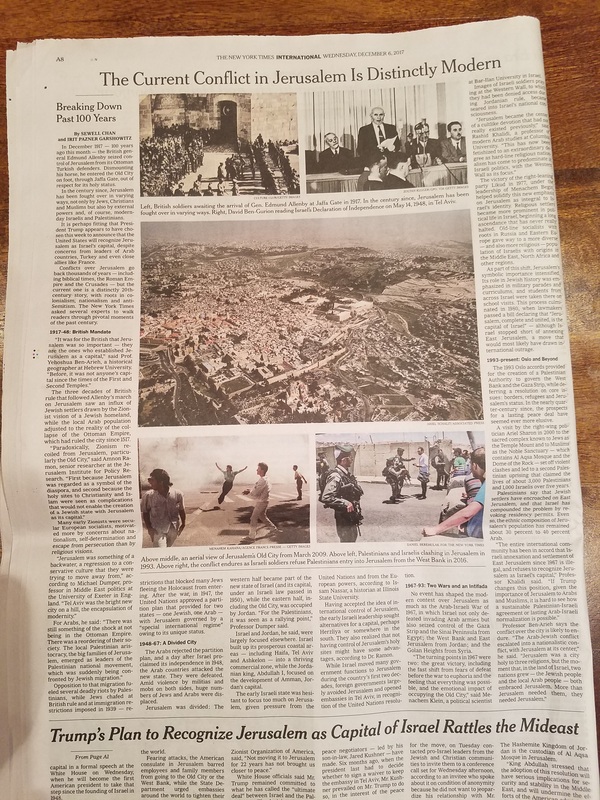 Did the Times write about the 3700-year history of the Jews in Jerusalem during the Abbas speech write-up? About the Jewish Temples? That Jews have been a majority in Jerusalem since the 1860s? No, why would it? The Times is part of the Palestinian propaganda machine. Quite some airtime for the Palestinian point of view. No, Pence delayed his last trip to secure a vote on the GOP tax bill. The Times gave a podium to a man that negated the history and rights of Jews in Israel and who supports terrorists both in language and money, printing 304 words of Abbas’s speech. It did not challenge a single word of his screed. Meanwhile, the paper took great pains to negate and belittle the US Vice President’s remarks, printing a mere 45 words of Pence’s speech. After US President Donald Trump announced that the United States is officially recognizing the fact that Jerusalem is the capital of Israel on December 6, 2017, many Arab and Muslim countries sought to make a declaration. They doubled-down on putting their heads in the sand. Turkey pulled together the 57 countries of the Organization of Islamic Countries, the OIC, to condemn the statement of the United States. Turkey’s President Tayyip Erdogan said that Jerusalem was a “red line” for the Muslim world and the OIC would reject any recognition of the eastern half of Jerusalem as the capital of Israel. That statement is a bit of a joke, as most of the countries in the OIC don’t even recognize Israel itself. Even in 2017, almost 70 years after the reestablishment of the Jewish State in the holy land, the presence of Jews still irks too many Muslim nations, including: Afghanistan; Algeria; Bahrain; Bangladesh; Brunei; Chad; Comoros; Djibouti; Indonesia; Iran; Iraq; Kuwait; Lebanon; Libya; Malaysia; Mali; Mauritania; Morocco; Niger; Oman; Pakistan; “Palestine”; Qatar; Saudi Arabia; Somalia; Sudan; Syria; Tunisia; UAE; and Yemen. 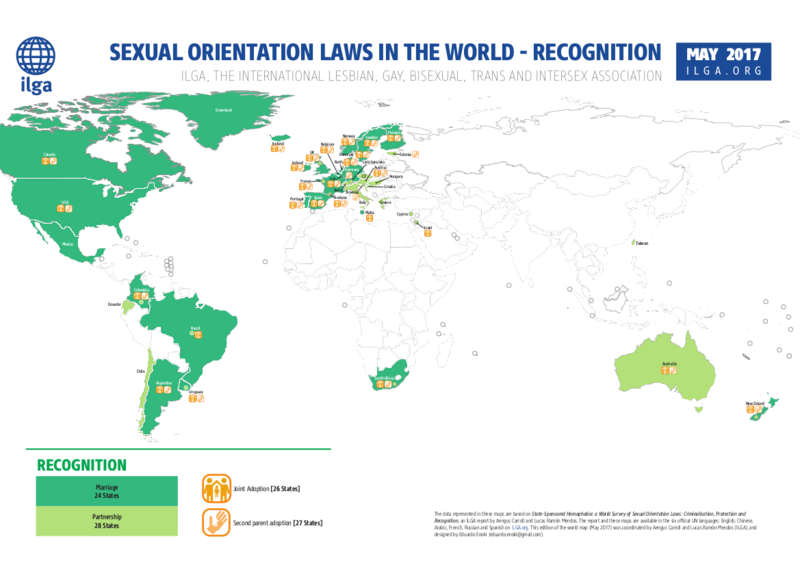 That’s 30 countries that do not recognize the State of Israel that came together to say that do not recognize its capital. It would be news if the anti-Zionist media would ever state this basic fact that these countries are deeply hostile to Israel in any form. It would be news if the media would not refer to “Arab East Jerusalem” in all caps as if it is an actual entity with endemic Arab roots. It would be news for the media to state that “East Jerusalem” only existed for 18 years (1949-1967) in the city’s 4000 year history. It would be news if the media would ever educate readers that Jews have been a majority in Jerusalem since the 1860s. It would be news if the media would give proper background that under Arab Muslim rule, Jews were forbidden from even entering the Old City of Jerusalem. 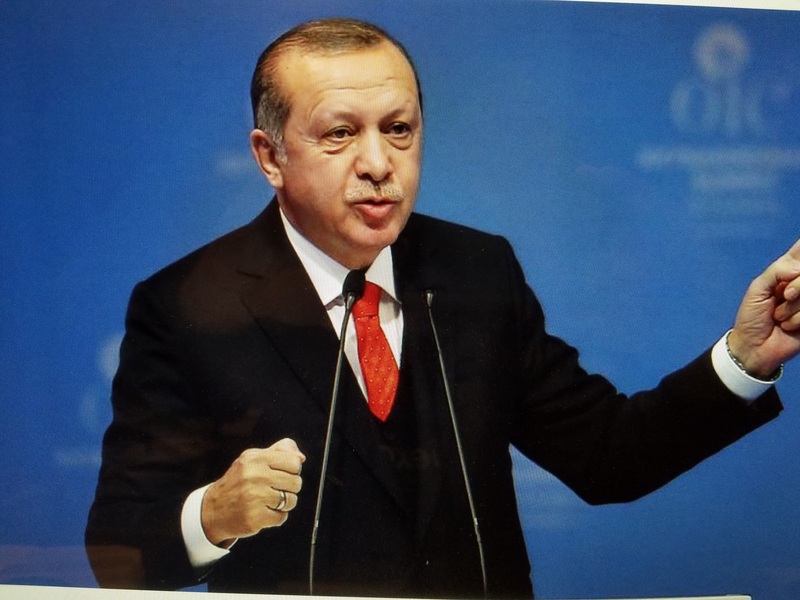 It would be news if the media would bother to inform its readers that the man who called together and hosted the summit, Erdogan, is the major sponsor and backer of Hamas, the most anti-Semitic terrorist group that waged three wars against Israel in just the past ten years, and that he is still angry at Israel for recognizing an independent Kurdistan. A squandered opportunity to show yet another example of the deep hatred that Muslims feel towards Jewish sovereignty in their holy land. 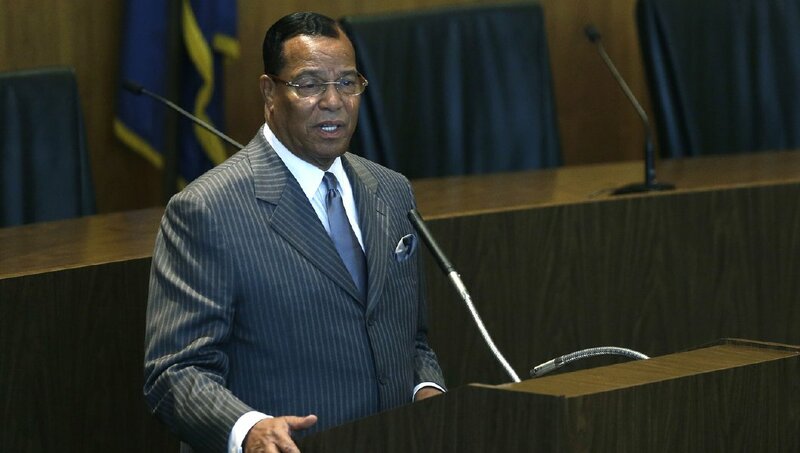 Instead, the media decided to report that a country like Iran, that has called for Israel to be wiped off of the map, is angry about the US recognizing Israel’s capital. Really. Are you still paying for that paper that tells you nothing? On December 6, 2017, on the eve of President Donald Trump recognizing that Jerusalem is the capital of Israel, the New York Times decided to give its readers a primer on #FakeHistory. Below are some details highlighting the liberal rag’s distortions. The article would go on to describe the nationalism of “religious settlers,” but never touch upon the deep antisemitism pervasive in Palestinian culture and actions. This is an outrageous lie. The Times would have readers believe that there was an Arab majority in Jerusalem for 400 years. These “local Arabs” watched helplessly as the British allowed these foreigners to take over their city. There were various demographic studies taken of Jerusalem for the past few centuries. They all agree that Jews have been a majority in the city since at least 1870, with the percentage growing well before the British took over in 1922. 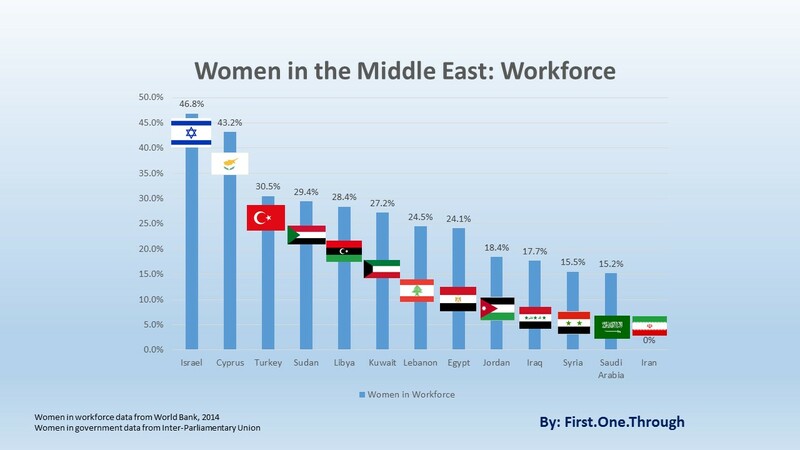 From IsraelPalestinian.procon.org which also compiled data from various British censuses. Jerusalem and Its Environs: Quarters, Neighborhoods, Villages, 1800-1948 by Ruth Kark, Michal Oren-Nordheim detailed the growth of Jews in Jerusalem after the Crimean War. Regardless of the source of information, Jews were clearly the dominant religious group in Jerusalem for as much as 30 years before the first Zionist Congress, and 50 years before the Balfour Declaration. To state that the Jews were interlopers into an Arab city is patently false and a complete inversion of history and fact. This is part of an ongoing false narrative that the New York Times gives its readers even regarding current events. For a despicable example, read “The New York Times will Keep on Telling You: Jews are not Native to Israel,” in which every Israeli – even those whose parents and grandparents were born in Israel – was described as a foreigner, while every Arab was described as a local. The Times continued to go over history, touching upon the 1947 UN Partition Plan. The Times will forever refuse to correctly state that the Holy Basin in the partition plan was much larger than just Jerusalem, and included Greater Bethlehem. Israel handed control of Bethlehem to the Palestinian Authority in December 1995 as part of launching the Oslo Accords with some tangible results. That concession of handing over half of the corpus separatum is never mentioned by the Times. The fact that Jordan’s annexation of the West Bank, the eastern half of Jerusalem and Bethlehem were not sanctioned by the international community is NEVER mentioned, while the world’s opinion about Israel’s taking of the West Bank and eastern Jerusalem is ALWAYS mentioned. 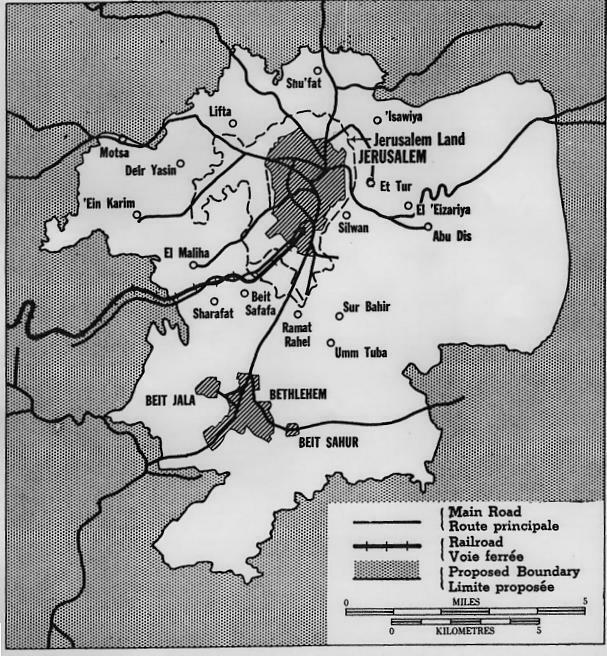 The fact that Jordan evicted all of the Jews from the eastern half of Jerusalem and the West Bank is NEVER mentioned. The fact that Jordan gave citizenship to all Arabs in the newly acquired territories but specifically excluded Jews is NEVER mentioned. Because for the Times, the problem is the Jews. Get the message? Israel really was never focused on Jerusalem until the 1967 war, according the Times. The Israeli national anthem, written in 1877, was focused completely on Jerusalem. Israel made Jerusalem its capital shortly after the war of independence concluded, in 1950. It placed all of its governmental buildings there. All of these facts about the early Zionists also doesn’t include the facts that Jews have always faced Jerusalem when they pray, regardless of where they are in the world. 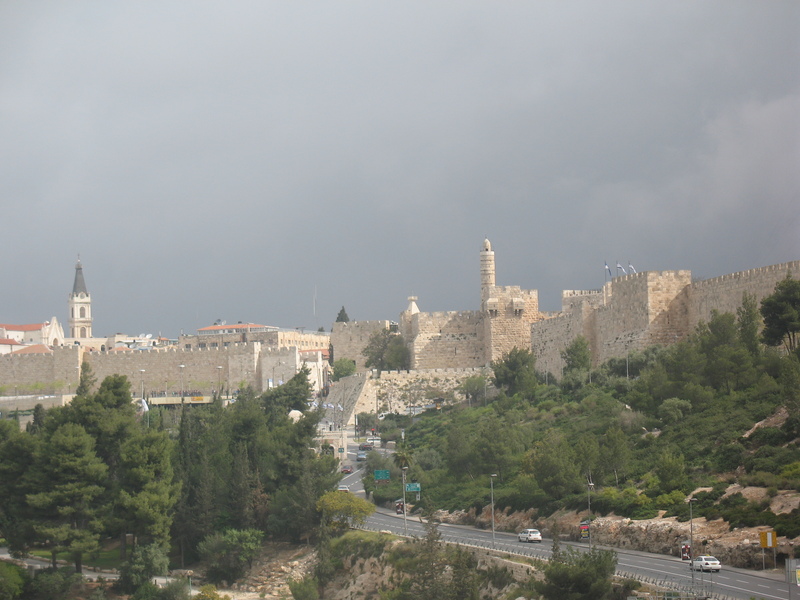 They pray for the return to Jerusalem and the reestablishment of the city to its former glory, several times a day. How does the Times spew the absurd notion that Jerusalem is a novel idea to Israeli Jews? The Times narrative continued that this once irrelevant city all of the sudden jumped into the minds of religious extremists after the Six Day War in 1967. 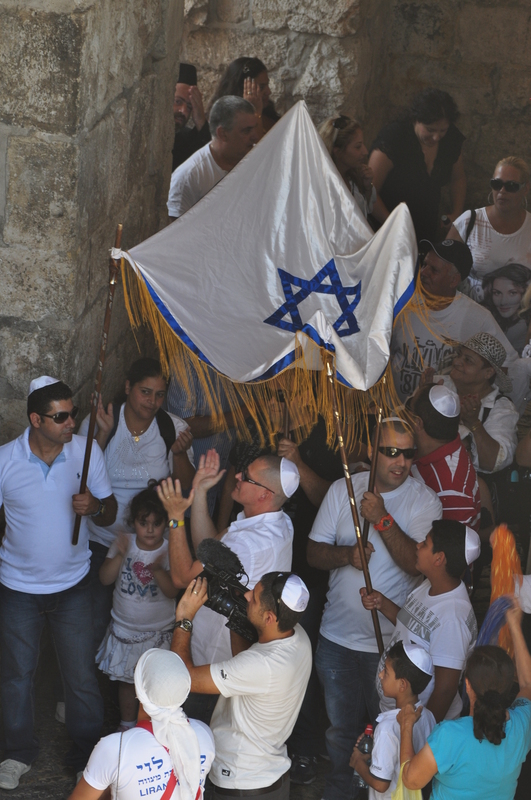 It is unquestionably true that many religious Jews flocked to Jerusalem. They have been doing so for thousands of years because it is the most holy city in Judaism. They are not “right-leaning” or “religious settlers.” They are people who came to live in their holiest city. As further evidence of the long-standing importance of Jerusalem to the entire country – even the “secular European socialists” that the article highlighted – was Israel’s adoption of a particular menorah as its national emblem in 1949: the one that was pictured in the Arch of Titus in Rome. That menorah symbolized the ransacking and destruction of the Second Jewish Temple in Jerusalem 2000 years earlier. 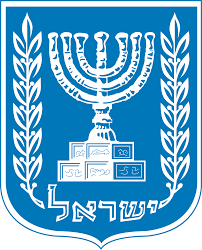 The deliberate selection of that menorah as the symbol of the Jewish State of Israel was to show that the Jews had returned from the diaspora, to its sacred land and holiest city, Jerusalem. 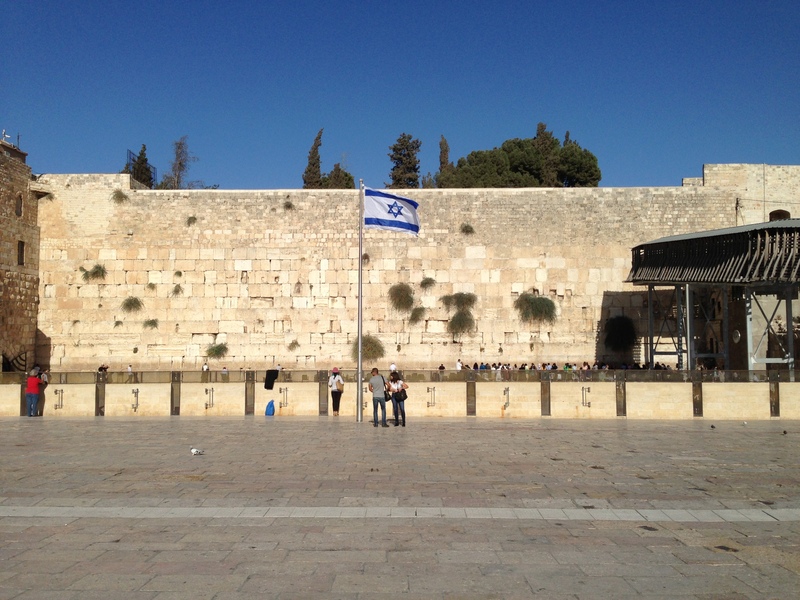 Today, the entire Jewish people continue to be engaged about Jerusalem. 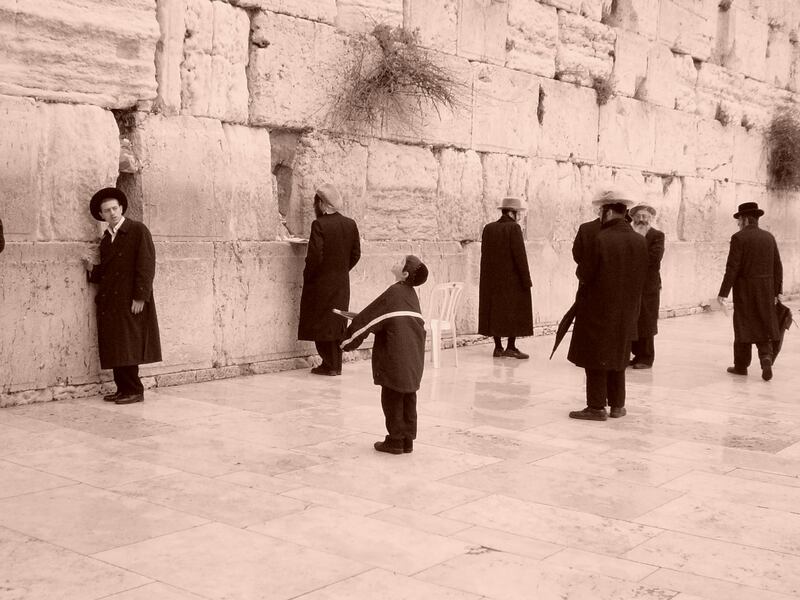 The current controversy surrounding creating a pluralistic place for prayer at the Western Wall is because of the strong interest of Reform and Conservative Jews for Jerusalem. 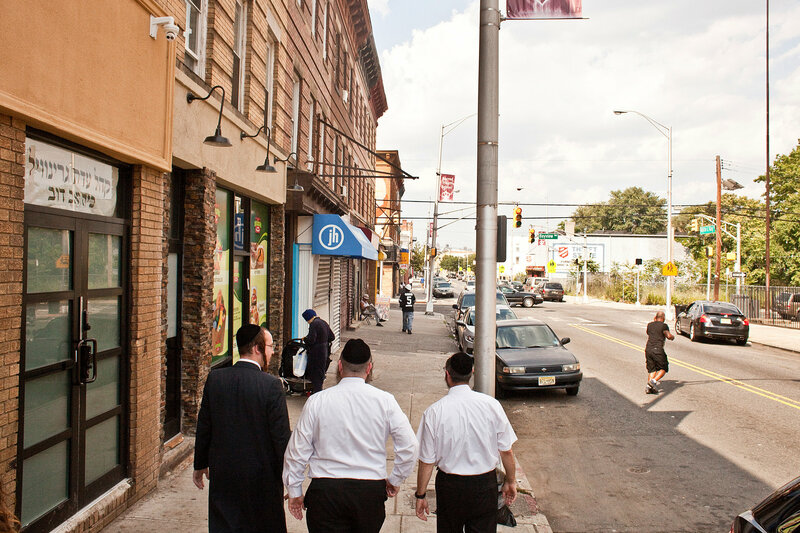 The notion that the city is only important to “cultlike… religious settlers” is absurd. As the Times never explained to readers that all of the Jews were evicted by the Jordanians in 1949, it made their appearance in the eastern half of the city seem strange and foreign. It is not. Jews returned to parts of their holiest city where they lived for centuries. The Times also did not give background to the international laws of 1920 (San Remo) and 1922 (Mandate of Palestine), which both clearly and explicitly stated that Jews could live throughout Palestine – including the Old City of Jerusalem – and that no person could be excluded from living anywhere in the land due to religious beliefs. No matter. The paper chose to quote anti-Zionists. It is surprising that it did not state that Zionism is a form of Racism. As the world waited for the United States to recognize the reality that Jerusalem is the capital of Israel, the New York Times fed its readers anti-Zionist red meat. It crafted an article that Jews never much cared for the Arab city of Jerusalem until 50 years ago, and that the only Jews who really care about it now are religious fanatics. The masters of #FakeNews are trying their best to instigate a jihad. On August 29, 2017, Nicholas Kristof penned an opinion piece in the New York Times called “The Photos the U.S. and Saudi Arabia Don’t Want You to See.” The article relayed the terrible suffering of the people of Yemen due to a civil war that has been exacerbated by competing interests of the Iranians and Saudis. The United States has supported the Saudi effort, and as such, held partial blame for the killing of hundreds of civilians in Yemen. Children have suffered terribly, both from Saudi bombing campaigns and from malnutrition, as the Saudis have been effective at blocking aid relief to the country. And all of this is unquestionably horrible, as Kristof relates. “Yet victims like Buthaina aren’t on our television screens and rarely make the news pages, in part because Saudi Arabia is successfully blocking foreign journalists from the rebel-held areas. I know, because I’ve been trying for almost a year to get there and thought I had arranged a visit for this week — and then Saudi Arabia shut me down. 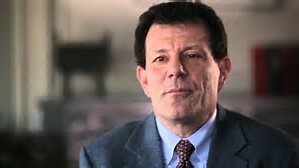 Kristof claimed that the government of Saudi Arabia actively stopped journalists from covering stories, which was why the media – like him – did not show pictures of innocent victims in Yemen. But what about the actions of his own paper, the New York Times? Did the Times show Israeli victims of Arab terror over the past years? No. It opted to show pictures of Arab victims. Did the Times show pictures of Israelis under attack by Hamas rockets in the Gaza War of 2014? No. It showed Gazans under attack. Did the Times show pictures of Barack Obama when he oversaw drone attacks that killed scores of civilians? No. It showed pictures of Israeli Prime Minister Benjamin Netanyahu when it covered stories of Palestinian Arab casualties. 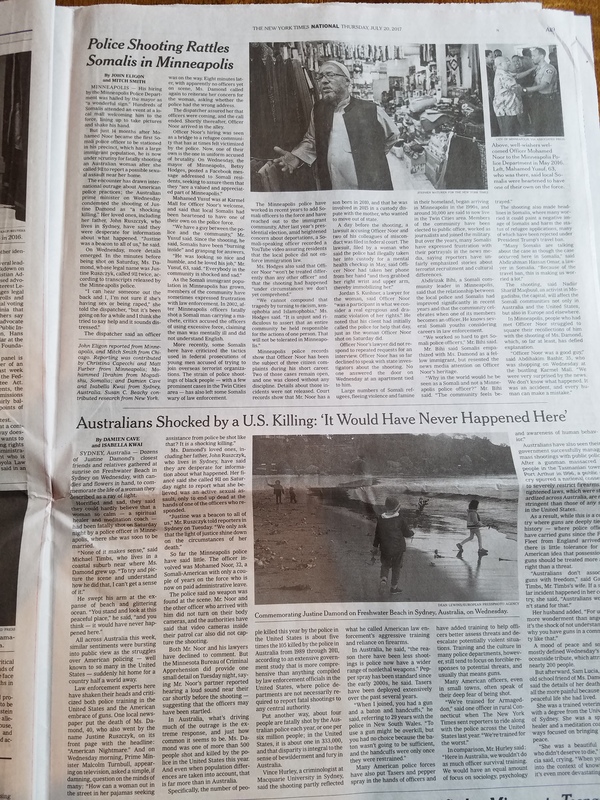 Did the Times put front page color pictures of the mass executions of Ethiopian Christians, or of the suicide bombing in Afghanistan that killed 35, or the 19 people killed in Somalia by al-Shabab in April 2015? No. On July 7, 2014 when 100 people were killed in attacks in Kenya, Uganda and Yemen did the Times publish any pictures? No. Of the ISIS beheadings? No. The NY Times posted a large color picture of an Arab boy that was beat up by Israeli police. I have no doubt that Saudi Arabia impedes reporting of its war crimes and that Kristof is upset both at his access to the stories as well as for the fate of the war’s victims. But his crocodile tears over the media being unable to show the world the suffering of victims is pathetic when he has long written for a paper that refused to show Israeli victims of Palestinian Arab terrorism. Why didn’t Kristof care to write such an article when Barack Obama was president supporting the Saudis in their campaign? Is his newfound concern simply because it would show President Trump in a bad light? Mr. Kristof: the failure to show pictures of innocent victims does not simply lie with the Saudis or the Trump administration. Your paper is part of the problem. The New York Times often decries bankers and the excesses of Wall Street. But only when associated with Republicans. On April 26, 2017, the Times ran an article about Hungary’s anger with billionaire George Soros. The Hungarian Prime Minister Viktor Orban was upset with the various left-wing institutions funded in Hungary by Soros including NGOs and a university. The Times came to the billionaire’s defense. George Soros spent more money on US lobbyists than Goldman Sachs and the National Rifle Association COMBINED. But the Times made light of the powerful global lobbyist by stating that he had an “affinity for Democratic and liberal causes,” as if he were simply an observer and not the master puppeteer. 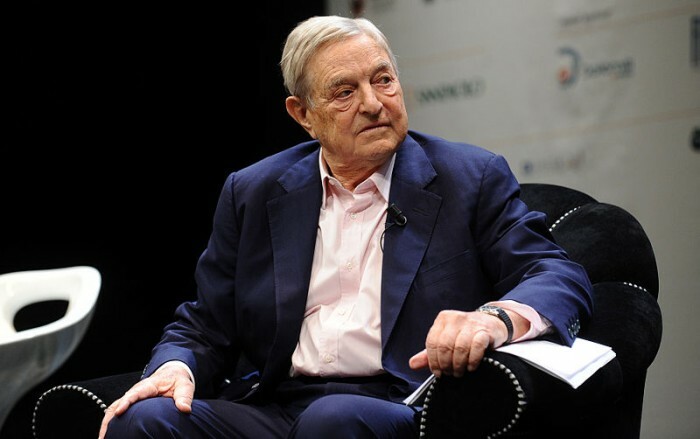 It slandered those opposed to Soros’s agenda by suggesting that the opposition was driven by anti-Semitism (as if a huge percentage of Jews weren’t also appalled by Soros’s behavior and causes). And the Times was of course shocked that a head of a government would attack a private citizen. In this case. The crowd of Reform Jews applauded Biden’s rebuke of the Israeli (who was not employed by the Israeli government.) 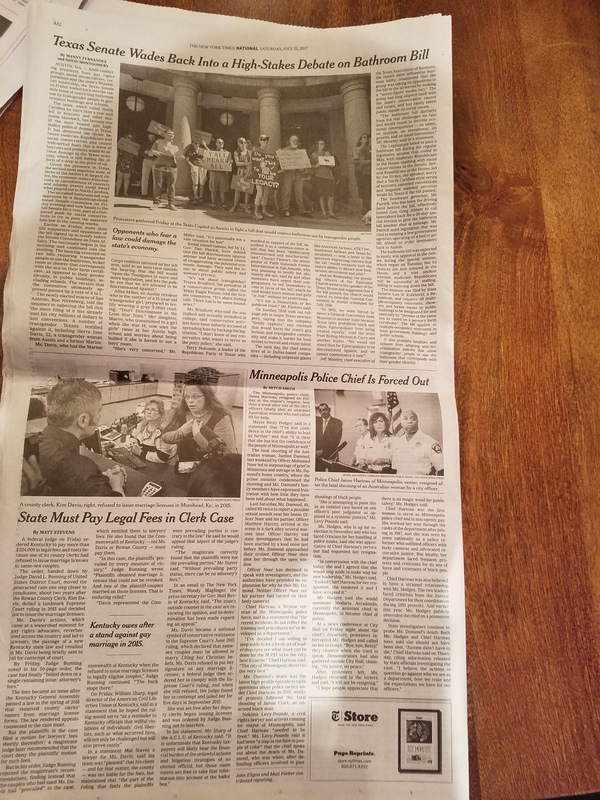 The New York Times decided not to cover the attack at all. When the liberal head of the US government attacked a right-leaning Israeli citizen, there was no sound of alarm. But the Times came to the quick defense of the liberal billionaire. Woe unto anyone criticizing a liberal – even a billionaire capitalist. The New York Times has ink for you.